Third String QB Spot Up In The Air | "IT'S A STEELERS WORLD"! One could only imagine what it must feel like being a quarterback drafted by the Pittsburgh Steelers since the arrival of Ben Roethlisberger. 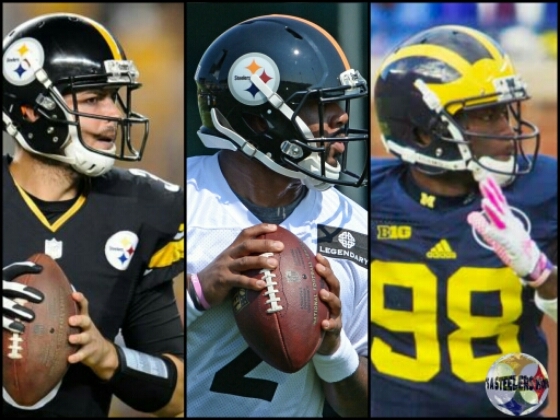 And with Bruce Gradkowski as Big Ben’s apparent backup, three other quarterbacks are fighting for that 3rd spot to make the 53 man roster. Landry Jones, in his third year was drafted in 2013 in the 4th round. They intended him to be the eventual number 2 and even talk of grooming him to take over for Ben some day. It’s not gone as planned. Jones is still stuck at 3, and barely hanging on, as evidenced by all the quarterbacks they brought in this year. He’s gotten a lot of snaps over the past few preseasons and has not been successful. Beyond not winning, and beyond not having good stats, he does not look comfortable out there. My Opinion: Time for Jones to be released and given a shot with another organization. 3 years + another soon to be 3 years behind Roethlisberger is a waste of talent. Tajh Boyd, entering his second year was a 6th round pick last year for the Jets. He was cut last year and picked up by the Steelers early this offseason. Kind of uneventful. His college career was much more exciting. He had a great college career in Clemson. He became the ACC all-time leader in passing yard and touchdowns, with 11904 yds and 107 TDs. He ran for 1164 yds and 26 TDs as well. Boyd played with Martavis Bryant at Clemson too so that helps. On the other hand, it also, along with Sammy Watkins and DeAndre Hopkins, means he had a pretty easy job throwing the ball at Clemson. My Opinion: Much more likely to land the 3rd string spot than Jones this season. May not get playing time..but an excellent auditioning tool. My Opinion: I like the sound of “turning over stones” for Gardner, since he is considered a double threat on offense. But this is definitely a decision I would not be in charge of making..thankfully I’m not. And as usual us Steelers fans faith lie in th hands of a very talented and knowledgeable front office and coaching staff.